You will receive a NON-PERSONALIZED PRINTABLE digital file for printing at home on cardstock [110lb] or photo paper and print as many copies as you want. Digital file for "Happy Birthday" banner. Design for letter size page (8.5" X11"). Prints 2 pieces per page (5"x7" each). 4 character & phrases pieces and 1 clear. High quality (300 DPI) in JPG and PDF printable formats. - Please note you will not receive any printed products. - All items are digital media only. - Real colors may vary from the colors on your screen. - This listing is an instant download, you can access the files once the payment is confirmed (less than 5 minutes). - For custom orders, buy the link indicated in the description, personalized files will be delivered to you via email. - You can print the files at home (PDF file recommended), local photo lab center or online. - Once printed, cut the pieces with a cutter and a metal ruler, and assemble the bunting using double stick tape or glue to secure. - No refunds and no exchanges for digital files. - You may not share or repackage these digital files for resale. PERSONAL USE ONLY, No commercial use allowed. 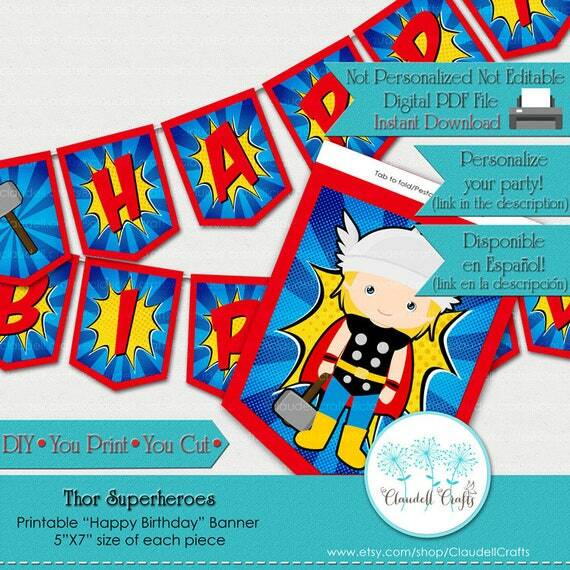 Design and templates from Claudell Crafts©. ♥Thank you for visiting my shop! Monsters Colors Inspired Printable Hershey Kisses Label / Round Confetti 0.75"